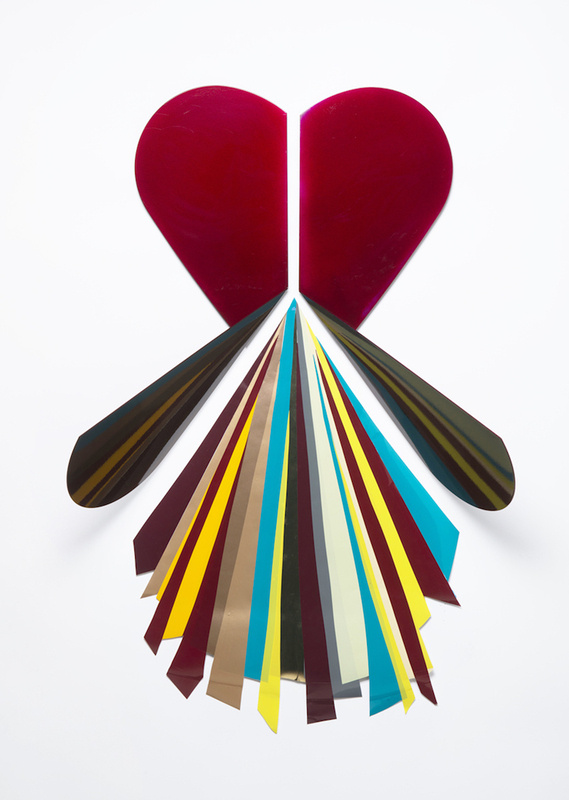 Cleave, 2017 - vinyl collage and powder coated steel - 40 x 30 x 12"
Traywick Contemporary is pleased to announce The Space Between, an exhibition of recent work by Bay Area artist Benicia Gantner. For her fifth solo show at the gallery, Gantner presents a new series of dimensional collages and wall-mounted sculptures. Known for her intricate vinyl work, Gantner recently introduced sculptural wall-based installations into her practice. The artist's unique relationship with color and form can best be described as a hybrid approach, which allows her to move fluidly between two and three dimensions with both minimal and exuberant gestures. Gantner's new vinyl compositions extend from the wall and picture plane to become sculptural forms executed in powder-coated aluminum and steel. A work titled Cleave consists of red and black wing-like shapes that frame a trail of colorful vinyl applied directly to the wall. Blank Box, a work on board, is an explosion of visual information, incorporating not only clusters and patterns of vinyl, but also studio remnants of various papers that are stapled and tacked in place. Gantner's series Double Red, Double Gold and Double Blue jettison vinyl altogether, playing with subtle color shifts across intersecting circular forms that bend and fold as if they've collided into one continuous object. The title of the exhibition, The Space Between, references Gantner's ongoing interest in the possibilities created between opposing forces. Her work reverberates from the push and pull of competing influences: organic vs. manufactured, analog vs. digital, reductive vs. cumulative, until a clarity can emerge from chaos. In the artist's words, "The work is about potential, the act of becoming, and the possibility of what lies between." Benicia Gantner is a Bay Area native, currently living and working in Marin County. Gantner has shown extensively since receiving her MFA from the Cranbrook School of Art, including exhibitions and installations at the San Jose Museum of Art, Marin Headlands Center for the Arts, the Oakland Museum's City Center exhibition program, Southern Exposure and the Richmond Art Center. Her work is in the permanent collection of noted Bay Area institutions such as the San Jose Museum of Art, CA; the Fine Arts Museums, San Francisco, CA; and the Crocker Museum, Sacramento, CA.